This post is sponsored by Mattel, who sent us a fun toy for our kids to try out! My little guy Harrison is following in the footsteps of his older brother, Carter. They are both tall blondes who love to play, use their imagination, and give the best hugs! Harrison wears all of Carter’s old clothes and even plays with his old toys! 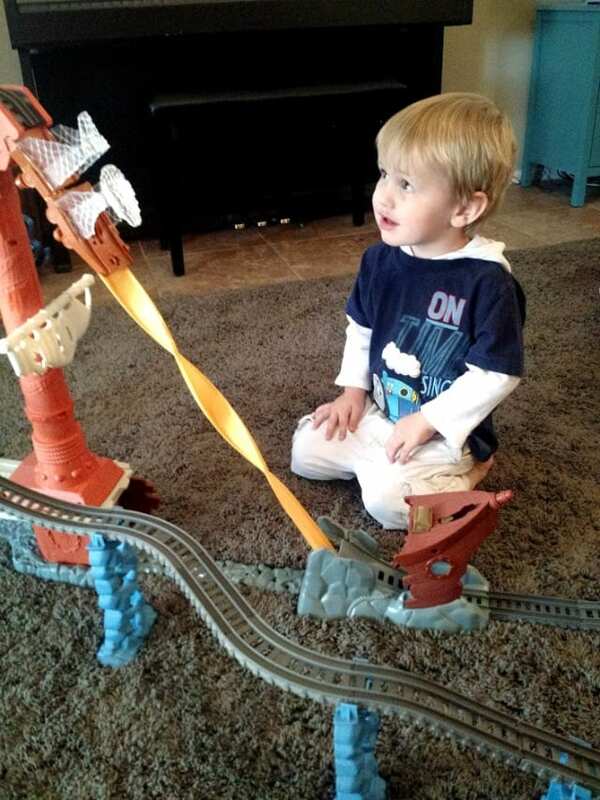 Thank goodness we held on to Carter’s box of Thomas the Tank Engine toys, because that is Harrison’s latest obsession! 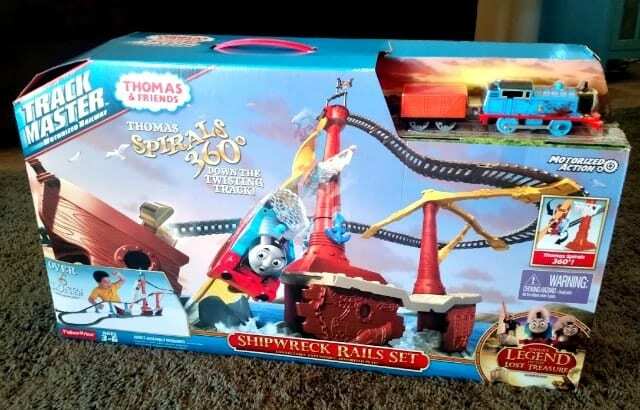 Mattel was nice enough to send us one of their latest Thomas toys, the Thomas & Friends™ TrackMaster™ Shipwreck Rails Set. Oh boy, was Harrison excited when he saw what was in the big box that was dropped off at our house! I intended on putting the set together when Harry was napping, so it would be all put together when he woke up and he could play with it right away. But, as is often the case, he didn’t stay down for his nap! So I crossed my fingers that construction wouldn’t be too difficult, and I showed him the toy! I was very lucky! There are many pieces to this set, but it only took about 10 minutes or so to put it all together. The directions were clear and easy to follow, and every piece was well-marked. I only needed one tool, one time, to open up Thomas to put in some batteries. 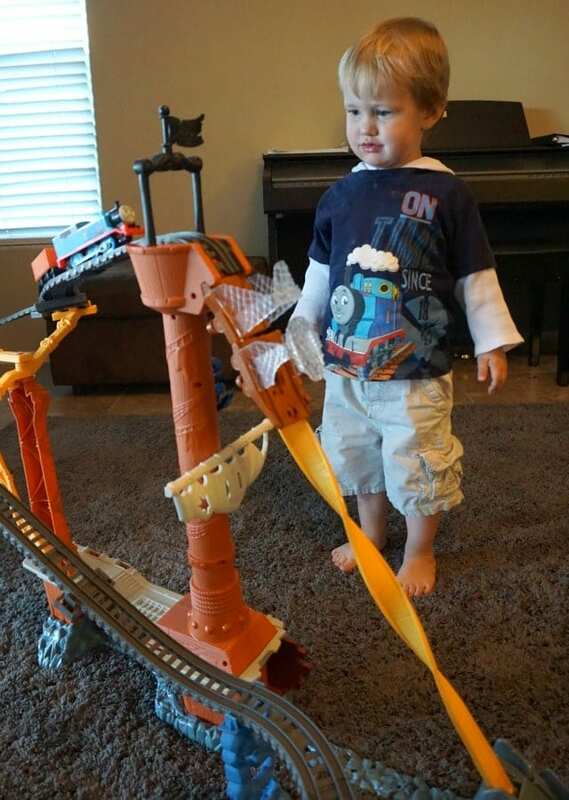 The Thomas & Friends™ TrackMaster™ Shipwreck Rails Set includes a motorized Thomas, with a cargo car, and a track that winds up a steep incline to the top of the ship’s mast. 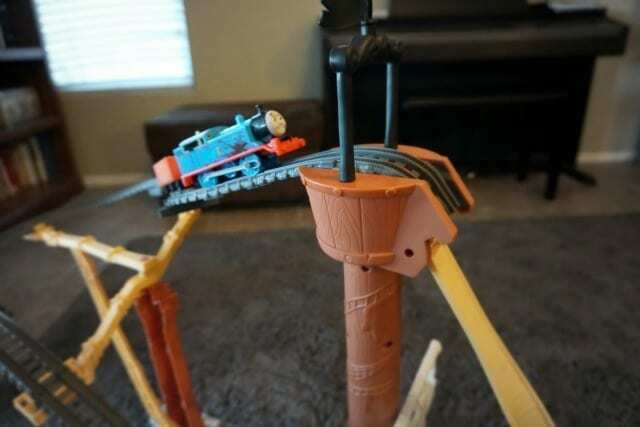 This is where Thomas is dropped down a spiral track and through the shipwreck, where he collects a treasure chest! Harrison was thrilled (and so were my two older kids when they got a chance to play with the set), and he loved watching Thomas climb the track by himself, as well as manually pushing Thomas around on the track. 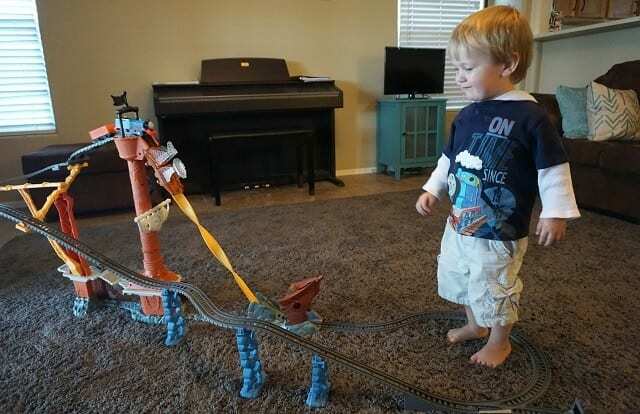 The two-foot high track was the perfect height for Harry to play while standing up (he is almost two and a half, and the toy is recommended for ages 3-6). Holiday shopping is about to get into full swing, so if you have a little Thomas lover, this will surely be a hit! The set is available at Walmart, Target, Amazon, and Toys “R” Us.